UK Lotto, or simply just Lotto, is by far the most popular lottery under the UK National Lottery brand—and for good reason. Its jackpots are impressive, its gameplay mechanics are about as simple as they come, and its odds are decent. If you’re wondering whether this lottery is worth playing, this review will answer all of your questions and show where UK Lotto sits among the top lotteries in the world. Although the earliest state lotteries in England go way back to a couple of financial experiments set up by the English government to raise capital in 1694 and 1967, the UK National Lottery as most people know it today officially began in 1994. After the Camelot Group was awarded the franchise in May of that year, the first draw took place on November 19, 1994. The game was rebranded from The National Lottery to Lotto (known as UK Lotto in other countries) in October 2002 and has undergone several format revisions over the years. For example, in October 2013 the Millionaire Raffle was introduced, and, two years later, the number of balls increased from 49 to 59. Other significant changes include the jackpot cap being lowered from £50 million to £22 million in 2016 and the prize amount at each secondary tier becoming fixed for each winner in 2018. The Millionaire Raffle was eliminated to make this possible, and the jackpot cap was replaced with a maximum number of rollovers (five) around the same time. UK Lotto been extremely popular across the UK for most of its existence, and approximately 15 to 45 million lottery tickets are purchased for every draw. In more recent years its popularity has attracted attention from neighbouring countries, and nowadays it is even played by some lotto lovers overseas (more on this later). 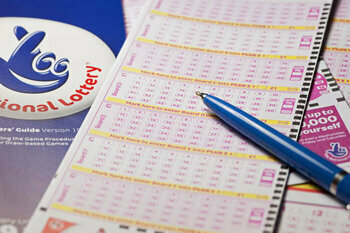 As mentioned earlier, understanding how to play UK Lotto is extremely easy. The game has a pool of numbers ranging from 1 to 59, and to win the jackpot you just need to match 6 numbers. Simple, right? Winning the secondary-tier prize, however, is a little bit different: you have to match not just five numbers but also 1 bonus ball. The thing that sets this lottery aside from other lotteries is that you don’t actually need to choose a bonus number. Instead, if the bonus number that’s drawn matches one of the six main numbers that you chose, you’ll win the second-place prize. All other prize tiers are won the same as most other lotteries—namely, by matching the numbers directly. Regarding UK Lotto’s rollovers, they are limited to 5 in total. If a Starting Jackpot isn’t won, it turns into a Rollover, which can become a Double Rollover, then a Triple Rollover, then a Quadruple Rollover, and finally a Must Be Won draw. If no one wins this draw outright, then the jackpot rolls down to all the secondary prize levels. In other words, you could win the jackpot even if you didn’t match all 6 numbers! The chances of winning the UK Lotto jackpot are decent: they are 1 in 45,057,474. This is much better compared to the US Powerball (1 in 292,201,338) and still quite a bit better than other European lotteries like EuroMillions (1 in 1 in 139,838,160) and EuroJackpot (1 in 95,344,200). However, when you consider UK Lotto’s five-rollover cap, there are other lotteries, such as Canada’s Lotto 6/49, that could potentially offer bigger jackpots and considerably better odds of winning at the same time. The UK Lotto draws take place twice per week, on Wednesday night at 8 pm UTC and on Saturday night at 7:45 pm UTC, at Pinewood Studios in Buckinghamshire. While these sums aren't quite as big as those won by the biggest lottery winners in the UK, they are still amazing. Unless the rollover cap is removed or adjusted, it’s uncertain whether the grand prize will ever reach these kinds of levels again, but even with the cap, it’s certainly possible that it will reach levels in the upper £20-million or even the £30+ million range. There is no annuity option with UK Lotto; instead, all winnings are paid out in cash as a single lump sum. The good news is that the UK does not consider lottery winnings as income, so those lucky enough to win a prize get to keep the exact amount that was advertised. However, once they deposit their winnings into a bank account, UK Lotto winners could owe money on the interest that they earn or the money they donate to others, including family members. If you're playing from another country, you won't have to pay any taxes on interest or anything else within the UK, but your country's government could still tax you, depending on what its tax laws are. If you're not sure about this, check your country's tax regulations. Although the UK National Lotto requires players to be physically in the UK or the Isle of Man at the time of purchase, there are ways around this using some of the world's best lottery websites. These types of services will either buy an official UK Lotto ticket on your behalf or allow you to bet on the outcome of the UK Lotto. They also offer lots of extra features such as group play and subscriptions that make it much more fun and convenient to play the UK Lotto online than in person—even if you are a resident of the UK or planning on visiting it soon. UK Lotto – Is It Worth Playing? UK Lotto offers much bigger jackpots than any other UK lottery, has straightforward gameplay mechanics that almost anyone can follow, offers solid fixed prize amounts for winners at the secondary prize tiers and decent overall odds, and takes place twice per week. On top of that, all winnings are tax-free, and a great chunk of the profits from ticket sales go directly towards charity efforts. While other lotteries with bigger jackpots and better odds certainly do exist, UK Lotto offers a pretty good balance of elements that at the very least makes it a lottery game worth trying. This lottery pretty good but very hard to win something good. I play it before but stop a while now. Are better lotteries to try IMO.